At International Bath & Tile, we look forward to the Hospitality & Design Show held in Las Vegas every year. It’s a collection of the most unique handmade and custom tiles with a focus on the hospitality and commercial industries. It’s an intimate setting that allows us to really get to know the brands and see their new and exclusive offerings. If you’re looking for eye-catching designs for restaurants, specialty shops, or hotel spaces, this is the show to be at. Very similar to IBT, the show had everything from fancy accents to incredible and practical tiles. We represent many of these brands exclusively because we’re known in the industry for carrying unique and different products, which gives our clients the widest range in looks for their projects. Based on what we saw at this year’s show, these are the trends and brands that are going to make a splash in 2017 and beyond. There were a few companies who showcased porcelain tiles that looked exactly like wood. The texture was incredible and very realistic; you could tile a wall and have it feel like you were in a barn. The wood-like tiles came in several different colors as well—painted white, yellow, and pale blue—so there are many design avenues to go down. 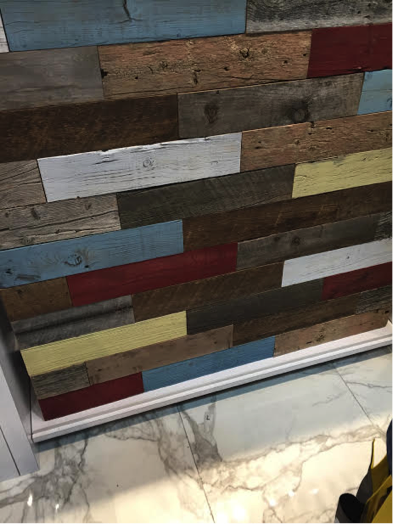 At IBT, we’ve recently used this type of tile in a juice bar in Solana Beach, so we’re happy to see that the trend will continue to grow throughout this year. 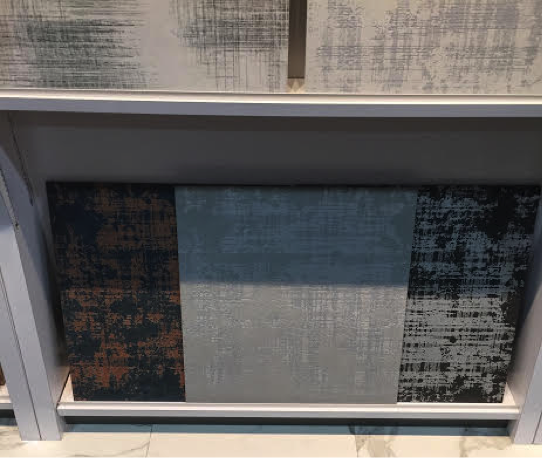 Just like we saw porcelain tiles mimic wood, we also saw several designs that looked like fabric or linen. The textile-like designs had a slightly weathered look and were neutral enough to use in just about any room or space. 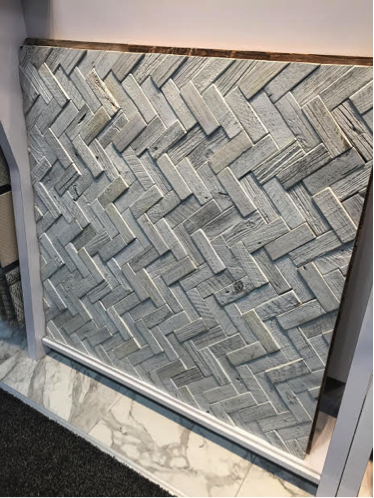 We’ve seen three-dimensional tiles before, but the designs we saw at the HD Show were especially remarkable and impressive. There were unique, protruding tiles that would make for interesting talking points in a commercial space. And since the tiles were made of porcelain, their practicality and durability is amazing. It’s not just the porcelain tiles that were impressive. 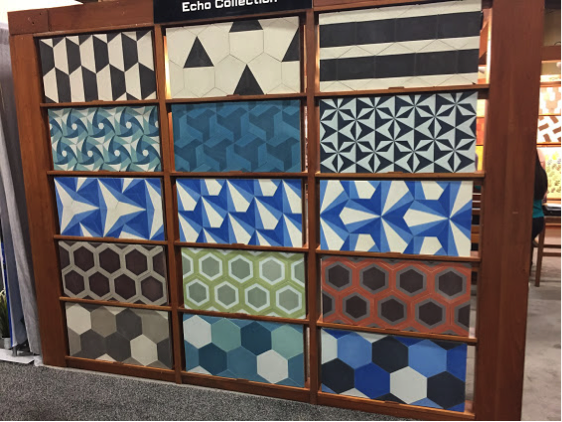 The cement tiles displayed at the HD Show came in beautiful patterns and all sorts of colors—from black and white to bright. The tiles also came in fun shapes, like octagons and chevrons, and could be used in many different spaces. We pictured them covering fireplaces and BBQs outdoors, and as flooring and countertops indoors. There’s so much practicality with cement, including easy maintenance, cost effectiveness, and versatile application for wall and floor tile, so we’re excited to see the cement tile designs moving away from just muted colors and traditional shapes. There were both porcelain and cement tiles showcased in much larger sizes at this year’s show. It’s a huge development that we’re excited to see. Technology is moving at such an advanced rate that companies are able to make larger tiles for commercial applications. Whether it’s for the floor of a car dealership or for the walls and counters of a restaurant, the larger size will create a standout feature for any commercial building. Championing the tiles with wood-like finishes was Specs Ceramics. Their display included porcelain tile in multi-colored wood finishes, like blue, yellow, white, and natural brown. Marmos is a brand new line we just picked up, and we’re the first in San Diego to carry the brand. The brand has incredible, unique patterns and designs with sophisticated style. 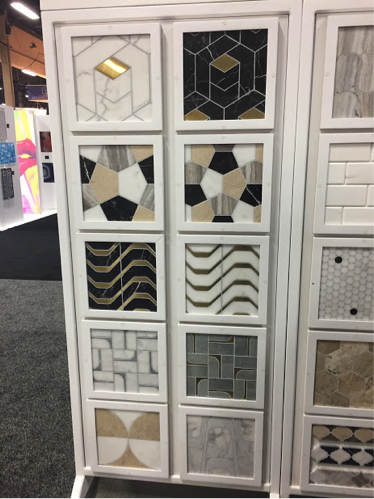 At the HD Show, they showcased gorgeous white Carrera marble with gold inlays that would be spectacular for a bathroom or powder room. 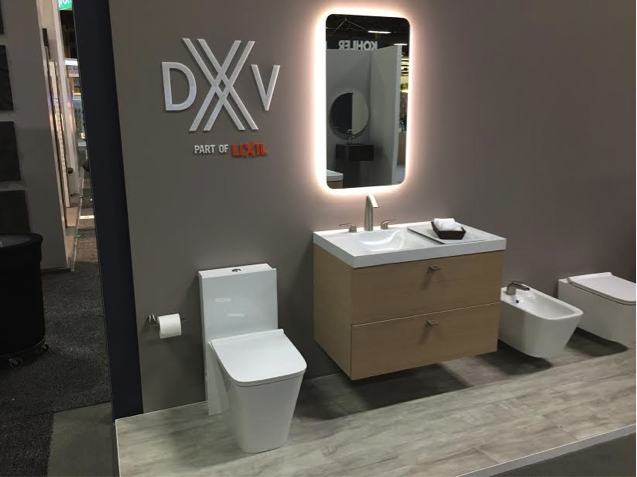 At the HD Show, DXV wowed us with their new wall-mounted products. The vanities and sinks had wood-like finishes and had an elegant, modern feel. We were also impressed with their new tub and faucet designs, which also had a simple but elevated elegance to them. Hansgrohe opened the show by introducing several new finishes. In addition to their polished chrome and brushed nickel, the brand will also carry polished brass and oil-rubbed bronze finishes. This puts them on par with competing with other manufacturers and will no doubt lead to more interesting designs in the future. Blomus is actually a bathroom accessory line. The products they had displayed at the show were sleek and sophisticated, and would look fantastic in a commercial bathroom. From what we saw, their accessories would even make brilliant gift items for a housewarming or wedding. 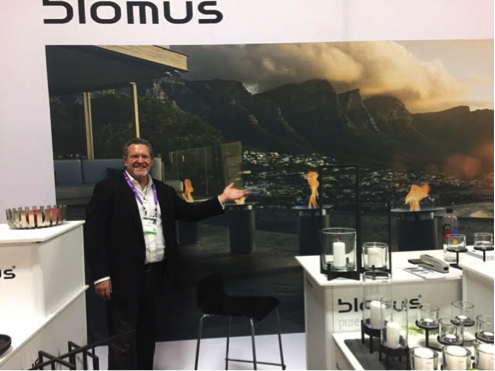 Clive particularly loved Blomus’ new ad campaign featuring his favorite city, Cape Town, South Africa. The photo above uses the breathtaking Twelve Apostles – a mountain range attached to Table Mountain, one of the eight wonders of the world – as the stunning setting for their ad. Moroccan Mosaic & Tile House caught our eye with their magnificent colors and designs. The company was founded in Morocco, and uses the same traditional craftsmanship in all their designs. We can’t wait to start using this line for decoration in commercial restaurants. 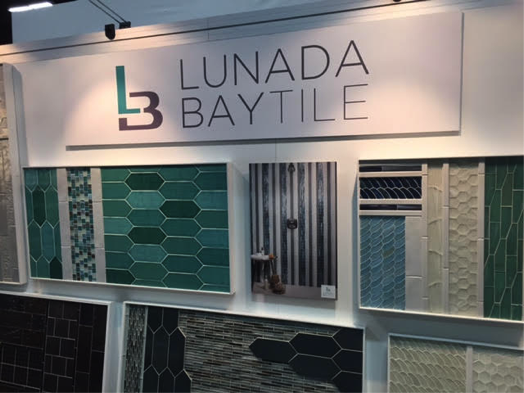 Lunada Bay almost always impresses us with their designs and displays, and their presentation at the HD Show was no different. They showcased new shapes, sizes, and colors of glass that were truly different than anything we’ve seen before. Across the board, from porcelain to cement, intricate designs to large sizes, everything at this year’s Hospitality & Design Show was extraordinary. Stop by International Tile & Bath to see the latest products and designs from the HD Show in our Solano Beach and Kearny Mesa showrooms. Whether it’s a commercial or residential project, you can expect excellent hospitality, products, and prices. We look forward to meeting you and helping you realize your dream space.